Private back yard deck with access to outdoor shower and lawn. Wall of windows from the back yard. Front of house provides a nice covered porch. Living room open to the kitchen and dining room. Bright and open living room area with access to the backyard. 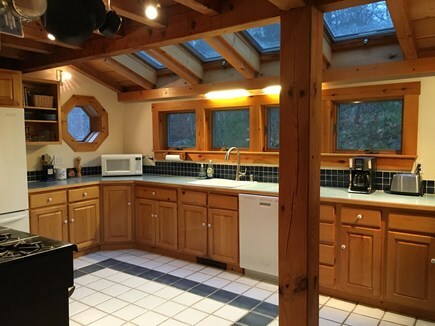 Open spacious kitchen with skylights and gas range. Spacious dining area open to kitchen and living room. Master bed room with queen bed and tv. 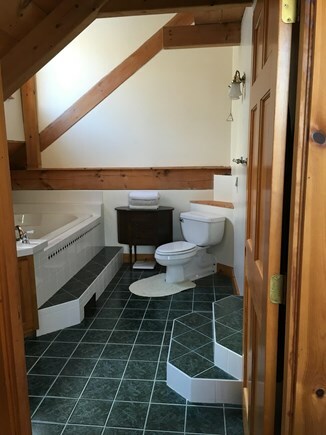 Attached master bath with skylight, jacuzzi tub and stall shower. 1st floor bedroom with queen bed and sofa. 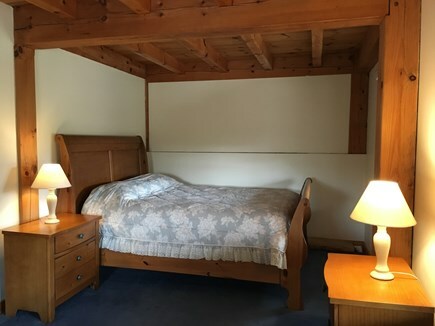 Roomy 1st floor bedroom with queen bed and sofa. 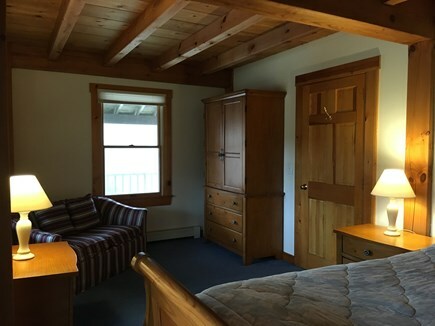 Cozy 1st floor bedroom with 2 twins. 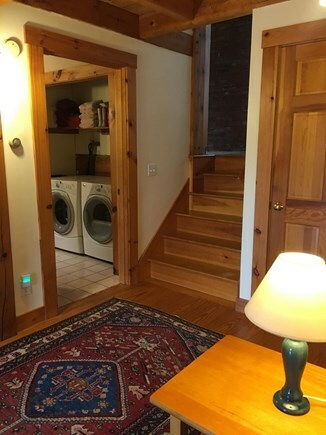 1st floor foyer entrance - 2 bedrooms and full bath with laundry. Interesting and open multi-level post & beam home. 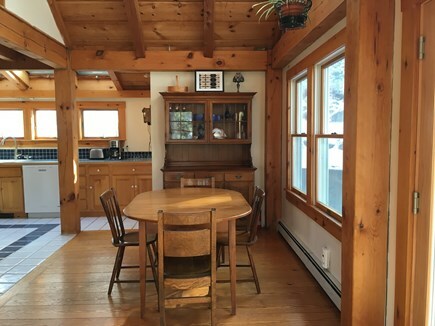 Enter our home through the covered front porch, and be welcomed by warm wood and light. 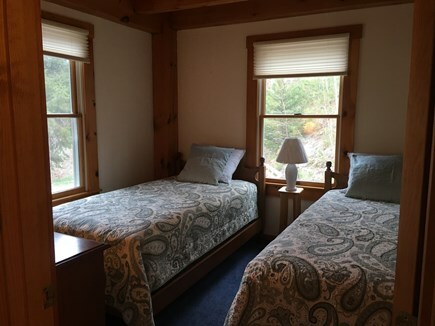 The first level has 2 bedrooms; one with a queen bed and the other with 2 twins. There's a full bath on this level along with the house washer & dryer. 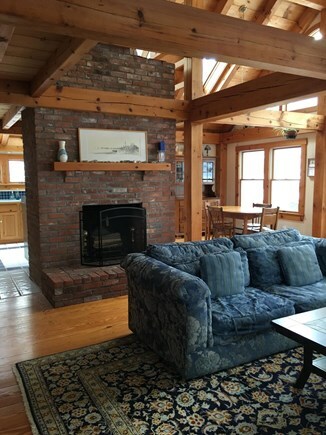 The next level up provides a warm and inviting living space with a floor to ceiling brick fireplace separating the kitchen/dining room and living room areas. The west facing wall of windows brings in lots of light. Use the slider door to visit the private back yard area with deck and a roomy outdoor shower! You'll find the master bedroom with attached bath on the next level up. 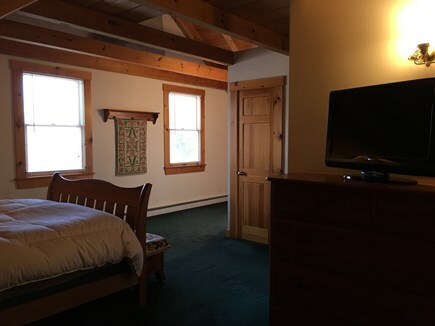 This bedroom has a window A/C unit as well as a ceiling fan for those warmer days. If you want to just relax, unwind and read a book continue to the sitting room on the 4th level. 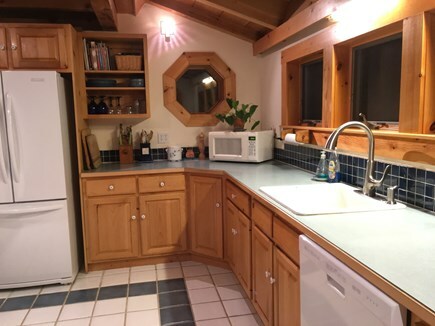 Our kitchen is user friendly with a 5 burner gas stove. For your convenience we offer both a drip coffee maker as well as a Keurig machine. 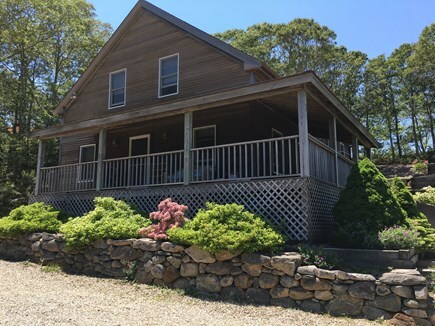 Our home is conveniently located and is near all Truro beaches as well as to the towns of Provincetown and Wellfleet. Additional pricing info: A $500 refundable security deposit is due with final payment. No other fees apply. State and local taxes of 12.45% will apply. 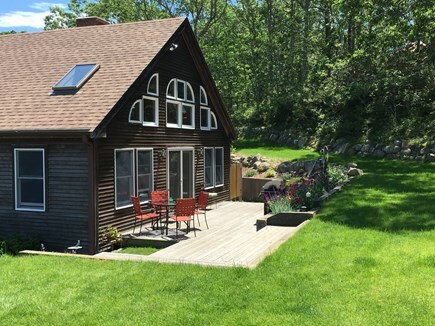 Laurie and John's Truro home is beautiful. No detail has been overlooked. The location was perfect for us as we loved the beaches in Truro and frequently went to visit Provincetown. I would definitely stay there again! Laurie is a Truro native who grew up a just mile away down by the Pamet River. John has been a builder on the Cape and has lived here for just about 40 years. 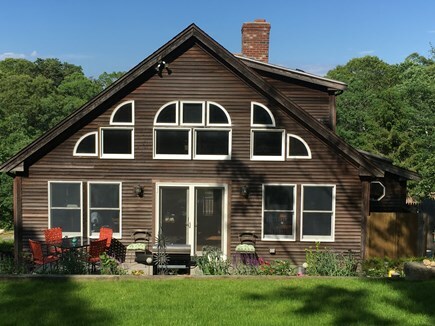 While we share this home (our primary residence) with guests we enjoy spending our time on the water up in Maine. This house is definitely a labor of love. We literally built it together back in the mid 90's. 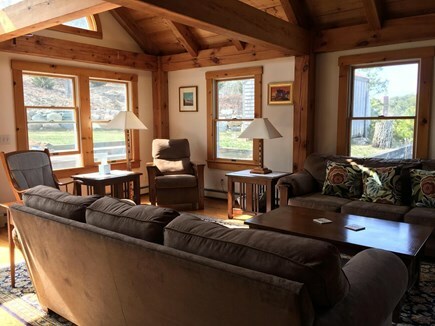 The post and beam aspect adds interest and the wood throughout is warm and inviting. The open concept provides for lots of space to entertain family and friends. Truro is special in so many ways! We like the diversity of beaches; having the option of going to the ocean or bay side. Our home is centrally located so it's less than a 10 minute drive into Provincetown and about 5 minutes to Wellfleet.